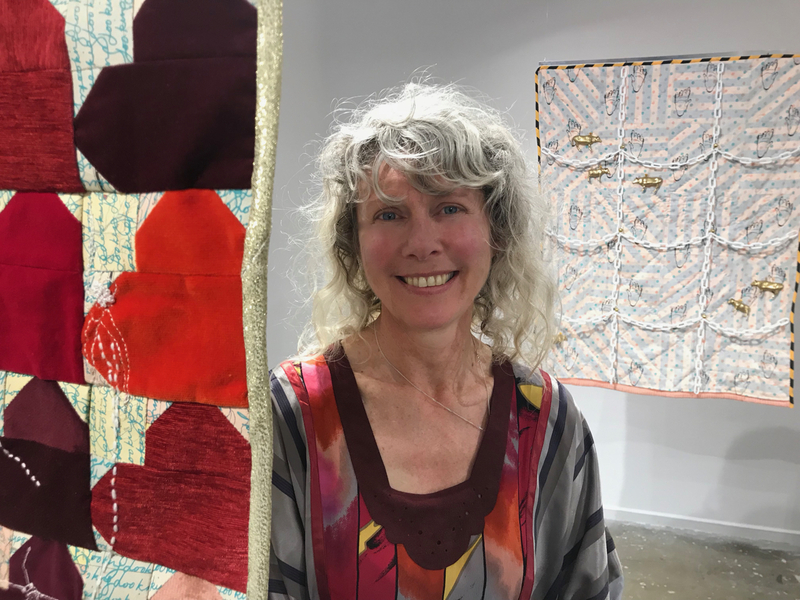 After making a big impression in Obsessive Impulsion at CCAS Gorman earlier in the year Michele England is flying solo at CCAS Manuka with Remnants, an exhibition with quilts and tea towels with a message. With these new works Michele continues to explore the habitats of plants and animals drawing parallels through the media of house hold objects. The quilts for example offer comforts akin to natural habitats, and the destruction of such habitats leads to extinction. Michele utilises the techniques of screen printing, machine sewing and embroidery to make work in her exhibition Remnants and she has collaborated with four conservation groups to produce tea towels that raise awareness of their activities. On sale during the exhibition are the artist’s designed and hand printed tea towels, showcasing these not for profit organisations and their excellent work. The tea towels are fantastic, (warning), and you will want to buy one so take some cash. Michele’s skills as a maker and her whacky sensibility are abundantly evident in the colourful scrap quilts, as is her unbridled passion for conservation. At CCAS Manuka until 25 November.